Please contact us to discuss your requirements for your own home. Alternatively arrange a valuation of your property, in person, here. The process of letting your home explained.. Details of the ongoing service we offer to our clients once suitable tenants have been sought. The property is situated within this attractive Edwardian Terrace in Canonbury, moments from the station. The period features of the 850+ square foot apartment have been restored, balanced alongside the addition of modern contemporary fixtures and fittings throughout." Accessed via it's own front door the first floor consists of two double bedrooms with built-in wardrobes, two stylish bathrooms and a kitchen/dining room with views over the rear communal garden. On the upper level there is an additional living room room with original fireplace and bay windows, a small bedroom / study with access to a balcony. Other features include video entry and full security system. The maisonette further benefits from access to the beautiful rear communal gardens which are both much enjoyed by tenants across the terrace & maintained by the owners' gardener. Upper Street and Newington Green are both within close walking distance. Available either part furnished or unfurnished from February '19. A quite exceptional three bedroom maisonette located on the end of this attractive Edwardian terrace in Canonbury. Spanning the entire ground floor of the building the purpose built maisonette boasts examples of the ‘Warner style’ architecture such as bay windows, steeply pitched gable roofs & stained glass windows to the front doors. Internally accommodation stretches over 1100 square feet & includes a main bedroom with well appointed en-suite shower room; further double bedroom - each of which with large fitted wardrobes; additional living room/ guest bedroom; main bathroom & large cellar/ utility room. The stand out feature of the apartment being the open-plan kitchen/ living space with French windows opening onto a private garden, the largest within the terrace, which offers both patio area as well as maturing garden* with lawn. A total refurbishment of the property three years ago has led to modern additions including: underfloor heating throughout; timber frame double glazed windows; additional sound insulation; video entry & Siemens/ Neff appliances throughout. * Monthly rent inclusive of maintenance of the private garden. A three storey, two bedroom house located on this cul-de-sac off Essex Road & close to Islington Green. The house features stained wooden floor boards throughout as well as traditional sash windows. Queens Head Street is within walking distance of the Angel. “Commercial conversion in secluded mews”. A second floor two bedroom, two bathroom apartment within this former warehouse located between Islington & Shoreditch. Situated towards the rear of the building the property benefits from a quiet setting. Accommodation includes two spacious bedrooms; en-suite & further bathroom & a spacious combined kitchen/ living space. 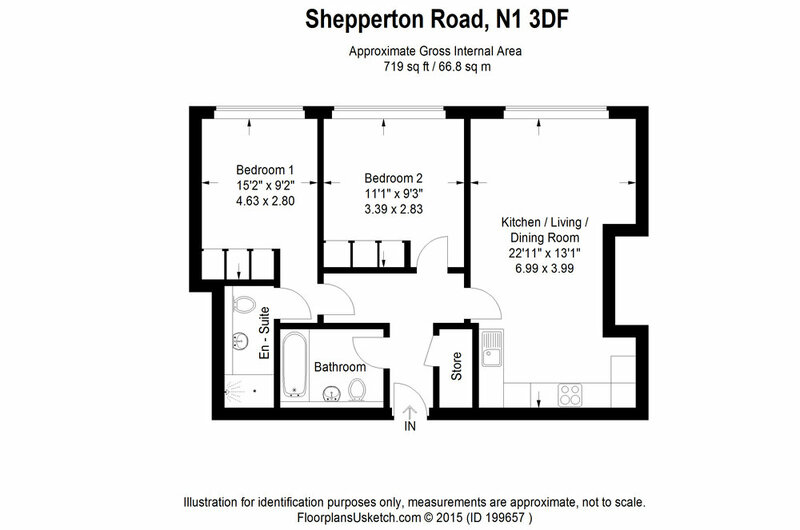 Shepperton Road also benefits from a gated entrance, video entry & lift. Essex Road overground station is within close walking distance & two further stops from Moorgate. The Regent’s canal is at the end of Shepperton Road providing access on foot to either Angel/ King’s Cross in one direction & London Field’s/ Broadway Market in the other. A larger than average one bedroom apartment spanning approx 625 square feet of the ground floor of this warehouse conversion on Liverpool Road. Liverpool Road is convenient for either Angel or Highbury & Islington stations making access across London straightforward. Upper Street is within stumbling distance as are the lesser well known pubs/ restaurants of Barnsbury. Available from mid April onwards on an unfurnished basis. “2nd floor one bedroom apartment”. A second floor one bedroom flat within this small modern development in Highbury. Featuring wooden flooring & double glazing the flat has a slightly unusual layout: a sizeable kitchen diner leads into a small separate reception/ living area. In addition there is a double bedroom with small fitted cupboard & bathroom with integrated shower. Black stock Road is convenient for access into town with Arsenal (Piccadilly Line) tube station within close walking distance. Highbury & Islington (Victoria Line) & Drayton Park (British Rail towards Moorgate) are also close-by.